Following The Equator: Voyages of Equinox: Nipper's on Sunday! Happy 4th of July! It was a fun day...we spent the morning relaxing and getting a few boat maintenance items taken care of (cleaning shower sumps, for one), before taking Tingum south on the Sea of Abaco to Great Guana Cay. We to introduce Paul and Muriel to Nipper's famous Sunday Pig Roast, and enjoy some beach time. So, with the tide still rising and Tingum's shallow draft, we opted to go through on the shorter inside route past Don't Rock. While skies were a bit overcast, seas conditions were fine for the run on the outside Atlantic through Whale Cay cut, too, which all the deeper draft vessels were doing. Perched high on the 40' dunes of Great Guana Cay, Nipper's overlooks the Atlantic and the Great Abaco Barrier Reef. 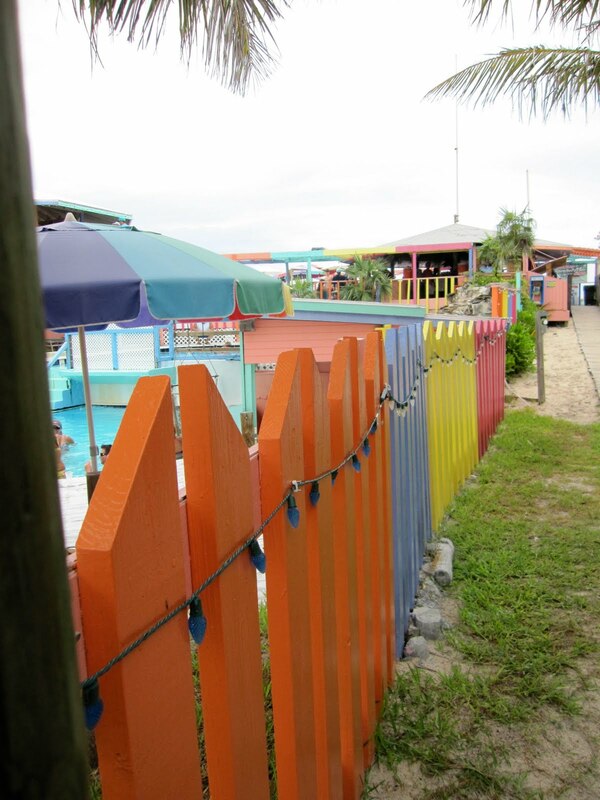 Nipper's is a blaze of multiple levels of colorful decks, dining tables and outside viewing areas, with two pools, a pool bar and an inside restaurant where they serve the bar's Bahamian wild boar roast buffett every Sunday. Beach entry is down a winding staircase along the front of the dunes allowing beach bums, snorkelers, divers and swimmers some of the very best access in all of the Abacos to a gorgeous 7-mile white sand beach and a well-developed reef system that starts less than fifty feet from shore. From the breath-taking views to the Bahamian music and revelry, it's always a lot of fun! And, our time there was just as fun! We enjoyed the buffett, a couple of Frozen Nipper's (their signature rum drink) or Nipper's on the rocks, then hit the beach for some swimming and relaxing. Being summer, there were many, many more people packed onto the decks and shoreline than when we were here in the winter and spring months!! Sportfish boats were lined up along shore, anchored off the beach in the light swells, and a great many folks, young and old were enjoying the waters. Many were in their colorful best of red, white and blue for the 4th of July, of course. It was a great afternoon; the warm Bahamian weather was glorious! The evening was a quiet one after the long day in the sunshine. We sat atop the flybridge watching the sunlight fade from gold to dusky purple, enjoying the cooling breezes, and delighted in seeing a porpoise leisurely swimming through the anchorage. A "Bohemian nibble night" of leftovers served as dinner, and before a late-night movie in the salon....a great way to close another Sunday in the Abacos!! "It was all going so well until then..."
Rain and guess what? Wind! Stranded Naked Cheeseburger Beach Party! !